If your in the business of coin-operated washers and dryers, that means that they need to be fully functional in order for you to obtain a profit. Coin-operated washers and dryers are highly specialized pieces of equipment so it is essential that you have factory certified technicians asses the problem. Some of these problems may include the slide mechanism being stuck in one position, an improperly leveled machine, or a leakage of some sort. Although repairing coin-operated washers and dryers are more complex than domestic laundry repairs, Los Angeles Appliance Repair is certified and experienced in servicing, maintaining and repairing them. At Los Angeles Appliance Repair we service and repair all major brands such as Maytag, GE, Frigidaire, Speed Queen, Kenmore, and many others. Customer service is our priority and we have built our business over the past 20 years due to our loyal and satisfied client base. 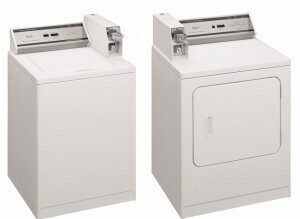 Call Los Angeles Appliance Repair Toll Free at 800-937-3035 to have your coin-operated washers and dryers fixed today. Our appliance repair office hours are Monday-Saturday from 7am to 9pm and Sunday from 9am to 5pm.